This exhibition celebrates The Contemporary Austin’s recent gift to the Blanton Museum and underscores our commitment to building a world-class collection of contemporary art in Austin. 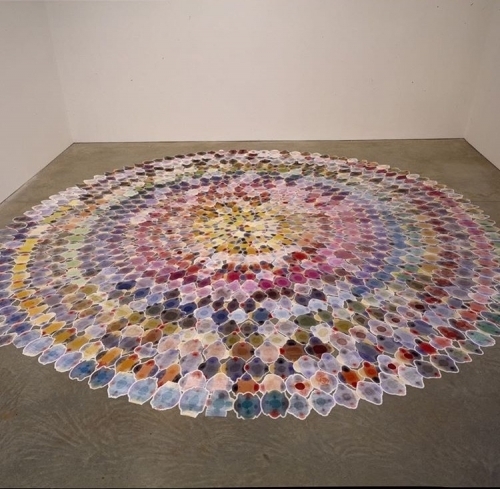 It features contemporary sculpture, drawing, and photography, including Polly Apfelbaum’s Townsville (2000), a sculpture composed of colorful hand-dyed pieces of velvet arranged in a spiral on the floor, and six prints made by Enrique Chagoya in collaboration with the poet Alberto Rios. One of the strengths of the gift is Austin- and Texas-based artists represented here with works by Jules Buck Jones (UT MFA, 2008), Lance Letscher (UT BFA, 1985; MFA, 1989), César Augusto Martínez, and Eduardo Muñoz Ordoqui (UT MFA, 2005).